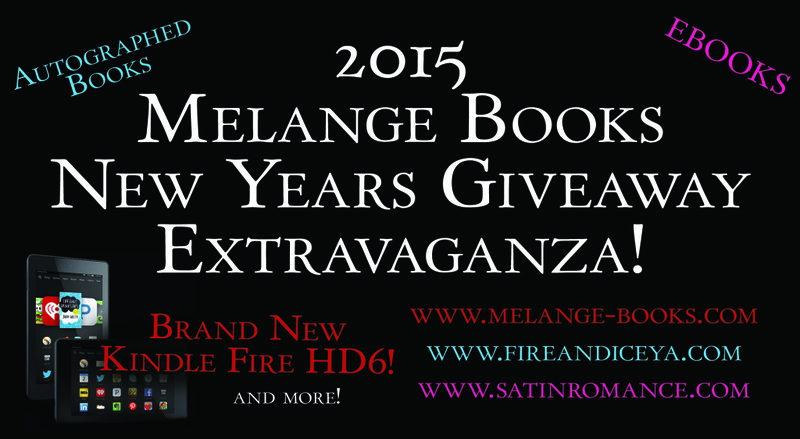 Melange Books » Giveaway » New Years Giveaway Extravaganza! Sorry for the email that went out early. Funny thing about time is that there’s an AM and a PM! Turns out I’d set the post to go live at 9 AM instead of PM! Regardless, our subscribers who saw that oops this morning know what’s coming – our Melange New Years Giveaway Extravaganza! I am so excited for this. We’ve done giveaways in the past here and there, but nothing like this. We’ve got ebooks, we’ve got ARC’s, we’ve got autographed print books AND one lucky winner will walk away with a brand spankin’ new Kindle Fire HD6 AND a $25 Amazon Gift Card to stock it full of books! How awesome is that? Even if you already have an e-reader, you know what great gifts they make. Instead of posting all of the giveaway sign up forms here on the blog, I’ve opted to list them on the Melange website to avoid the wonky formatting that sometimes happens with the blog posts. And for the blog comments entries, come back and leave a post here! NOTE: There are a LOT of giveaways on that link above! Please let the page fully load all of the giveaways before entering. Click the link, go check your Facebook or Twitter, then check back! Tagged Alex Stone, Alice J. Black, Alyssa Cooper, Anne Rothman-Hicks, Aubrey Wynne, B. K. Fowler, Brenda Ashworth Barry, C.G. Eberle, Caroline Akervik, Charmaine Pauls, D. G. Driver, Daphne Olivier, David Simms, Dennis K Hausker, Dorothy Stephens, Elisabeth Hamill, Erin Elliott, Gabriel Constans, Giveaway, Herbert Grosshans, Jenny Twist, Jill Bisker, JoAnne Myers, Jody Vitek, John Rachel, John Steiner, Joy V. Smith, JT Adeline, K. C. Sprayberry, Ken Hicks, Kindle, Larry C. Kerr, Laura Kennedy, Leslie D. Soule, Marianna Boncek, Martha Deeringer, Mathias G. B. Colwell, Mysti Parker, Nancy Pennick, Nell DuVall, Nora Crofton, Patricia Gilkerson, Peter Kassan, Rie Sheridan Rose, Ross Bonander, S.C. Dane, Shannon Kennedy, Shari Dare, Shelley R. Pickens, Sherry Derr-Wille, Tara Fox Hall, Tim Forder, Valerie J. Clarizio, Victoria Bastedo, win. Bookmark the permalink. 18 Responses to New Years Giveaway Extravaganza! This looks like fun. What an array of prizes. Way to go Melange. We pulled out all the stops on this one, Robert! I would like win Finding The Way Back on EBOOK by Jill Bisker and GC. Best of luck to you in the drawing, Darla! That one looks awesome, doesn’t it?